I have three mementos of the First World War that belonged to my maternal grandfather, Alfred Alexander Anderson. 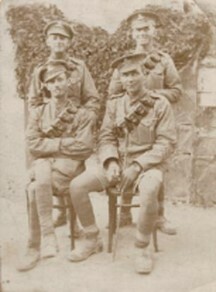 The first is a sepia photograph of my grandfather with three of his colleagues. This is not a formal studio portrait, but was obviously taken somewhere out in the field. The men are posed in front of what looks like canvas and they are wearing shorts, with desert boots and puttees; they have ammunition belts slung across their jackets. Two of the men are smoking and one is holding what could be a riding crop. The men look relaxed and are all smiling slightly for the camera. We do not know who the other men are or if, like Alfred, they survived the war. My grandfather spoke very little of his First World War experiences, certainly not to me and not to my mother Beryl, his youngest daughter. The only family story my mother remembers is an account of my grandfather jumping from the side of a boat into the Suez Canal as a dare. The fact that the men are dressed in shorts in the photograph suggests that this picture could have been taken in Egypt. 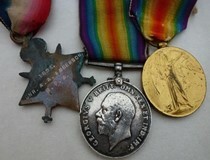 I have three medals from the First World War belonging to Alfred: the 1914-15 Star, the British War Medal and a Victory Medal. Both the Star and British War Medal bear the designation 1653 GNR A A Anderson RFA, but the Victory Medal is in the name of 27190 PTE A Knox E SURR R. The abbreviations GNR and RFA on the medals indicate that Alfred was a gunner in the Royal Field Artillery. As the Victory Medal bears a different name it seems that Alfred misplaced his own medal and decided at some point to obtain a replacement. My final memento is a small notebook measuring only 6 x 10 cms. The notebook does not have a cover, is slightly torn, stained and brown with age, and, in places, the handwriting is difficult to read. This notebook was kept by my grandfather during his active service overseas and part of it constitutes a diary. The keeping of diaries by servicemen in front line positions was discouraged, but the practice seems to have been not uncommon. The size of Alfred’s notebook is such that it could be easily carried in a top pocket. The notebook confirms that my grandfather was in Egypt and he was engaged in the defence of the Suez Canal, although jumping into the water as a dare is not mentioned. Entries in the notebook include details of inoculations in 1915, names and addresses of family and friends, and a list of dates of “letters received” and “letters sent home” starting in October 1916. The diary entries begin in November 1916 and are brief, usually only a few words, but they do include place names and thus give an indication of my grandfather’s involvement in various actions in the Middle East. Using the notebook and a copy of my grandfather’s military record, which luckily survives in the National Archive, I have managed to piece together some of his story. Alfred Alexander Anderson enlisted on 30 November 1914 in Norwich. His attestation papers state that he was 22 years 9 months old, 5 foot 5 inches tall and had a chest measurement of 36 inches. He was passed fit for service as a Gunner in the Royal Field Artillery (RFA). The RFA was a mobile force, deployed close to the front line, with medium calibre guns and howitzers. It was organised in brigades, each containing a series of batteries. The Norfolk batteries were part of the First East Anglian Brigade and were artillery for the 54th (East Anglian) Division, which included infantry from the Norfolk and Suffolk Regiments. There are two service numbers in Alfred’s military record – 1653 and 875553 – reflecting a re-organisation of the artillery units as the war progressed. The First East Anglian Brigade was re-designated the 270 Brigade in May 1915 and became the 272 Brigade in December 1916 (upon the breakup of the original 272 Brigade, formerly the Third East Anglian Brigade). 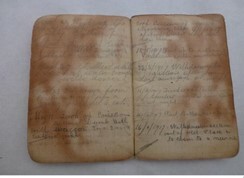 Alfred’s notebook records that he was a driver with B Battery, 272 Brigade. In his service record Alfred is listed as both gunner and driver, pointing to some flexibility in these roles. No doubt the men received an element of cross-training with regard to serving the guns or serving the horses, making replacements in the field easier to accomplish. 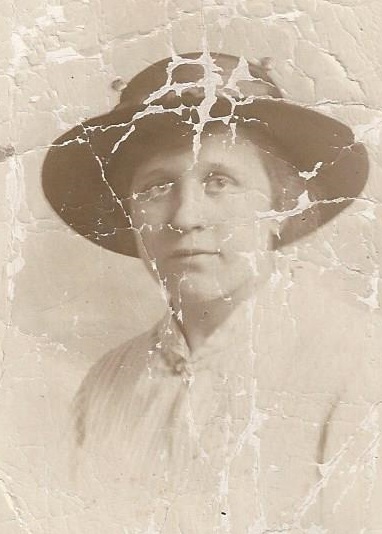 The period 30 November 1914 to 14 November 1915 was spent “at home”, presumably undergoing training, and during this time my grandfather married Rosanna Cossey. The wedding took place on 22 May 1915 at Norwich Register Office and it was some six months later that my grandfather was sent overseas. The artillery had remained at home when the 54th Division sailed for service at Gallipoli in July 1915. However, Alfred’s military record shows that he left England for France on 15 November 1915, embarking at Southampton and landing in Le Havre on 16 November. The artillery joined the Expeditionary Force France and were reportedly located at Blaringhem in the Pas de Calais region where they were attachedto the 33rd Division, a Kitchener’s Army unit whose own divisional artillery were still undergoing training at home. The East Anglian Artillery were only in France for a few months before they were sent to Egypt as part of the Mediterranean Expeditionary Force (MEF). They began the move to Marseilles by train on 11 January 1916 and on 30 January Alfred embarked ship for Alexandria. He did not return to England until April 1919. The MEF was under the command of General Archibald Murray from March 1916 and was redesignated the Egyptian Expeditionary Force (EEF). Turkey had become an ally of Germany in November 1914 and, after their victory at Gallipoli, it was feared that the Turks might launch a major offensive against the Suez Canal, an important supply route for Britain. Alfred arrived in Alexandria on 14 February and the artillery were initially concentrated at Mena Camp in Cairo before being deployed along the Suez Canal. Sadly there are no entries in Alfred’s notebook for these early days in Egypt when he was based within sight of the Pyramids. 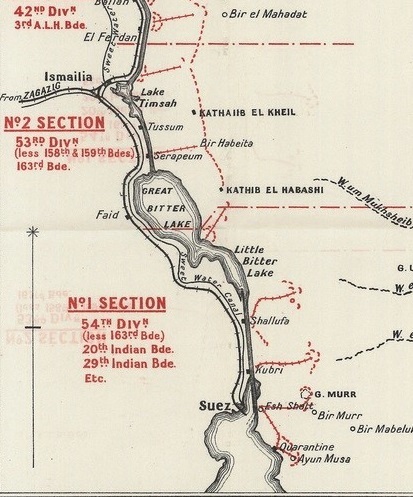 Defence of the Suez Canal was divided into three sectors (northern, central and southern) and in early April 1916 Alfred’s battery moved to the southern section near Suez. Two months after this move, Alfred became a father. Rosanna gave birth to twin girls, Edna Mabel and Margery Rose, on 9 June 1916. When Alfred got to learn about the birth of the twins is not known. Although Alfred kept a list of dates of letters sent and received, his diary makes no mention of news from home. Given that home leave was not possible for the majority of personnel of the EEF, letters from home must have been of great importance to the men. The diary section of Alfred’s notebook begins in November 1916 when his brigade is down at El Kubri, some 12 miles north of Suez, and there are “Rumours of moving, but was stopped after we had packed up”. A copy of a map from the Great War Forum website shows the position of the Suez Canal defences in July 1916 and the location of El Kubri. By August 1916 the Turkish offensive into Egypt had ended and the Turkish forces retreated into Palestine. The focus then changed from defence of the canal to advance into Sinai and Palestine. The 54th (East Anglian) Division was placed on Desert Column Establishment at the end of January 1917 with orders to march east. Alfred reports a move on 20 January 1917 from El Kubri to Moascar, near Ismailia at the bottom end of the Canal. Moascar camp is where the Allied training depots were located. It was initially a collection of tents, marquees and wooden shacks, but by the end of the war had tarmac roads, electric light and miles of railway sidings. The day after arriving at Moascar, Alfred writes “See Fred. Very windy. Bad wind storms”. Various encounters with Fred are reported by Alfred throughout the diary. Fred is Alfred’s brother-in-law, 204653 Private Frederick Cossey, who was serving as an infantry man in the 1/4 Battalion Norfolk Regiment. Both men survived the war and maintained their friendship into later years. The war diary for the 1/4 Norfolk Regiment shows that they were engaged in brigade and divisional training at Moascar from 11-31 January 1917, thus giving Alfred and Fred the opportunity to meet. There is a gap in Alfred’s diary from the end of January to beginning of April 1917. He reports leaving Moascar on 4 April, moving through El Ferdan and Kantara (east side of Suez Canal) before arriving at Deir el Belah on 8 April. Deir el Blah is located in the central Gaza strip. It was the HQ of the Eastern Force and the location of the coastal supply route. Cargoes were landed on the beaches and then transported to forward supply depots and ammunition dumps. Supplies also arrived via the Sinai railway. The artillery was transported by this route, but the war diary for the 1/4 Norfolk Regiment shows that at the beginning of February they had proceeded into the Sinai by route march, arriving at El Arish camp (north Sinai) on 6 March. The move by the artillery to Deir el Belah was connected to the build-up for the Second Battle of Gaza. The town was of strategic importance to the allied forces as they attempted to push the Turkish army north. An earlier battle for Gaza took place in March 1917, but was unsuccessful and there were heavy casualties. Alfred’s brigade does not appear to have taken part in this first battle. Alfred’s diary is interesting with respect to the things that he does and does not mention. Some of the obvious features of desert warfare, such as heat, cold, sand or flies, are not commented upon. However, Alfred does make mention of wind, rain, thunderstorms, hail, lice, cigarettes and Christmas dinner. The diary reveals something of the logistical challenges and undoubted monotony of war. There are many references to ammunition carting, drawing rations, going after water, servicing guns and securing forage for the horses. Securing water supplies for men and animals was undoubtedly a continuing problem in such an arid landscape. Periods of routine involving care of horses, harnesses, wagons and guns, were interspersed with periods of action. This was a war of movement, with the guns being continually shifted to new positions. The first note of any action in Alfred’s diary is a simple statement on 14 April to the effect that “Enemy shelled camp” and two days later “B Battery took up positions for purpose of shelling Gaza”. On 19 April, Alfred reports that he “went to first line of trenches with [?] Lambert of the 10 London Regiment. Saw Fred on the way. Under heavy shell fire for 2 hours”. The war diary of the 1/4 Norfolk Battalion shows that they had taken up position on Sheikh Abbas ridge prior to launching an attack. In the next few days Alfred takes a series of camel transports up the firing line. In the desert terrain, camels were an important means of transport for supplies due to their ability to carry heavy loads and to exist for days at a time without water. An entry for 22 April reports that on taking the camel transport up the line he “found that Fred was safe” and the following day Alfred writes “camel transport up line and see all the boys, who were glad to see me and I was glad to see them”. Casualties are recorded on 25 April (one rigger and two smiths killed) and Alfred reports being shelled while down at the water trough with the horses. On 28 April B Battery was withdrawn from their position and they “rest in a barley field fit to cut”. The landscape around the ancient city of Gaza was bisected by water courses and obviously amenable to cultivation. The second Battle of Gaza was also unsuccessful and this second defeat prompted a change in command of the EEF, with General Sir Edmund Allenby assuming control of the Allied forces in June 1917. In the immediate aftermath of the Second Battle of Gaza, stalemate ensued, with position warfare along a front stretching from the Mediterranean beaches through to the Negev desert. B Battery took up position again on 11 May. Alfred writes “took up position against Dumb Bell Hill [which is to the south-east of Gaza] with wagon line 2 miles behind the guns”. On 14 May an entry in the war diary of the 5th Battalion Bedfordshire Regiment states that 20 enemy were seen filing from left to right of the Cactus Hedge position. 272 B Battery were informed and several rounds of shrapnel were fired which caused the enemy to disappear. Alfred’s diary does not make mention of this incident. On 16 May a section of guns was moved to Mansura Ridgeat night. The 5th Battalion Bedfordshire Regiment war diary indicates that a working party of 200 enemy soldiers were seen on 17 May around 600 yards north-west of Cactus Garden. 272 B Battery opened fire and managed to land 4 out of 7 shots into the party, which scattered. An entry for the following day, 18 May, reports that 272 B Battery and 265 C Battery were engaged in gapping the wire on Outpost Hill and registering the gaps. Alfred’s diary reports ammunition carting on that day. An entry in the diary for 22 May shows that the section was withdrawn from position, “having lost ourselves at night”. An attack by the Turks on 11 June is described by Alfred as the “loveliest sight I ever saw at night”. Alfred’s notebook suggests continued activity on Mansura Ridge with the guns taken forward on 7 July for wire cutting. Another attack by the Turks occurred on 19 July, followed by two days of bombardment when the ridge was reportedly taken – “We bombard and take the ridge. Out all night. Got lost”. On 22 July Alfred documents seeing an aircraft brought down by the Turks. Planes were initially used as spotters for artillery rather than necessarily for attack purposes. B Battery was withdrawn from their position to a rest camp (not stated) on 5 August. On 20 August there is the first mention by Alfred of gas drill – “went through a gas tent”. Gas was used in the second Battle of Gaza, as were tanks, although there is no mention of the latter by Alfred. At the endof August, Alfred reports that the battery moved back to its old position. The month of September passes without major incident and on 23 October Alfred heads to El Arish on leave. Alfred returns from leave on 30 October and the following day he comments that the “Stunt starts. Went with ammo to new gun pits”. The stunt in question is the third Battle of Gaza. Alfred is concerned again with transporting ammunition to the gun pits and an all-night bombardment takes place on 1 November. Alfred mentions that a Sergeant Chapman is killed and some of the boys wounded on 2 November. By 8 November the Turkish Eighth Army was in retreat and Alfred’s battery moved up after the retreating forces, a move that Alfred describes as “the worst I ever had”. On 14 November the battery moves again, towards Jaffa, and one of the few mentions of food appears in Alfred’s diary – “boys get plenty of oranges, the best you could get”. Jaffa was taken by the Allied forces on 16 November. 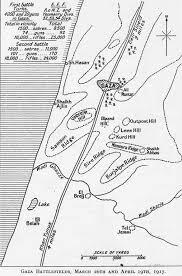 In the following days the battery remains in the vicinity of Jaffa, with Alfred reporting a series of moves to Midze, Ramleh (ancient Arimathea), Surafend, Ludd and Wilhelma. The weather is inclement as the rainy season begins and Alfred remarks on heavy downpours at night. The wet and cold undoubtedly added to the logistical difficulties of supplying the men and animals. 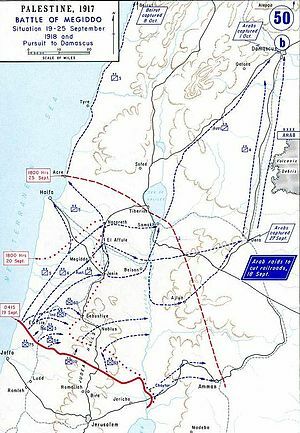 During this time the 54th Division was involved in establishing a bridgehead to the north of Jaffa across the Nahr el Auja river. The division’s main camp was established at Wilhelma. The Turkish forces counter-attacked at the end of November. Alfred’s diary entry for 27 November reads “Turks shell us out of village, horse killed and two wounded, and eight men wounded. Out all night”. The same occurs the following day, when Alfred says one man was killed, as well as several horses, and “my team had a nasty fall, but thank god we came through safely with a bruise or two”. The guns were moved forward to a new position and Alfred brings ammunition forward by camel. He states “Caught spies up a tree. Have not had a wash for four days. Properly chatty [infested with lice]. Took camels to gun line. Heavy firing at night”. It is interesting to speculate as to whether the “spies” were indeed individuals trying to gather intelligence on troop movements or local people who had got caught up in the action. Alfred carries out a service of the guns on 30 November and the battery is then involved in another series of moves, with Alfred engaged in ammunition carting. Places mentioned by Alfred at this point include Dirty Reach and Railway Junction. It was at this time that, sadly, one of Alfred’s baby daughters, Edna, died of convulsions (9 December 1917). The diary gives no indication of the arrival of bad news, but it must have been hard for Alfred to lose a baby daughter he had never seen and to be away from Rosanna when she needed support. While Alfred’s battery was involved in maintaining a defensive position around Jaffa, other forces under Allenby’s command had moved to secure Jerusalem and on 11 December Allenby entered Jerusalem on foot via the Jaffa Gate. Alfred reports a cheerless Christmas day during a period of heavy rain – “the worst I have ever spent, not a smoke or any signs of them”. Given the level of advance of the Allied forces, it seems probable that it took some time for new supply lines to be established. The new year starts in Mulebbis, a settlement south of the Nahr el Auja river. The entries for January 1918 reveal that Alfred is again involved in ammunition carting, drawing rations, bringing up the water cart, and collecting forage for the animals. On 14 January he sees his brother-in-law Fred, having broken down when going after the forage wagon. Christmas dinner is provided on 25January, but is apparently“not very good for the time”. There are few diary entries in February, with the bad weather continuing. On 2 and 3 March Alfred reports that the Turks shell Mulebbis and on 11 March B Battery guns take up a forward position in front of the first line trenches, before moving again the next day to Tin Town. There are no further entries by Alfred until 24 March, when he reports “hail stones, largest stones I have ever seen”. This is corroborated by an account by the officer historians of the 1/5th Suffolks of seeing hail stones as large as potatoes on that day. In early April, the diary documents that three Turkish aircraft are brought down and there is another round of gas training. On 18 and 20 April, Alfred is carting ammunition for the Suffolk Regiment (most likely in support of the Battle of Berukin) and on 26 April his battery takes up a new position in a vineyard. There are no reports of further ammunition carting, only a trip to Ludd (purpose unknown) when Alfred gets caught up in a thunderstorm. On 15 May Alfred reports a move to a rest camp and the battery then heads to El Arish for a period of leave. Back home Alfred’s paternal grandfather died on 11 May 1918, age 73, of bronchopneumonia and heart failure. As a child, Alfred and his father had lived with his paternal grandparents. Again there is no mention in the diary about the arrival of bad news. Alfred’s period of leave ends on 8 June, but the diary gives no indication of activities until a march past on 17 June, which apparently “went off grand”. On 21 June there is a move to Orange Post with reports of the enemy shelling the ration dump and bringing down a balloon. The battery then appears to be withdrawn again, moving to Surafend (near Ramleh) on 25 June, then to Ludd, and arriving in Kantara on 27 June (these movements were done by rail). Gas drill takes place on 2 July and then Alfred states that he goes to Port Said for the day. On 9 July, Alfred leaves Kantara for the front line, going through Surafend before arriving at Selmeh (near Jaffa) on 16 July. There are no further entries until, at the end of July, Alfred reports that they move for 3 days’ action on MG Ridge and have “no sleep for 2 days”. The battery then moves to Mejdal Yaba (4 kms east of Jaffa). Activity continues into August, with the Turk forces shelling the water wagon, another series of moves and reports of a Turkish plane brought down. At the end of August, Alfred states “Saw Freddy again and we had a good time”. Not long after seeing his brother-in-law, Alfred is admitted to hospital in Ludd and transferred to Kantara and Cairo (2 September). He starts back for his unit on 14 September and reaches his battery on 1 October. While Alfred was in hospital, the British undertook a major offensive along the coastal Plain of Sharon and into the Judaen Hills, known as the Battle of Megiddo. The dates of the attack were 19-25 September. A combination of cavalry, artillery, infantry, armoured vehicles and aircraft produced a decisive victory for the Allied forces. A deception campaign in the Jordan Valley convinced the Ottoman forces that the attack was going to be launched further east, while the main offensive was actually further west and up the coast. When Alfred rejoins his battery they are moving north in pursuit of the retreating Turkish and German forces – “Reached battery. Still keep marching up”. On 3 October 1918, Alfred states “Stopped for a rest at Haifa. Saw Fred again’”. The battery passes through Acre, Tyre and Sidon, before arriving just outside Beirut on 31 October. The Turks signed an armistice on 31 October and the following day there is a ceremonial march into Beirut, during which Alfred says “Had a man commit suicide while mounted”. The 1/4 Norfolks had also made their way up the coast, with their war diary documenting that the 21st Corps Commander (Lieutenant General Edward Bulfin) took the salute at the ceremonial march. Alfred then has a day’s pass into Beirut where he reports that “Things were very down, some of the people were starving”. As the military action ended, the Allied forces had to contend with another enemy – disease. The Spanish flu epidemic and a concurrent malaria epidemic impacted servicemen and local people alike. In early November Alfred has another problem with his health and reports to number 15 Casualty Clearing Station. He was diagnosed with bronchopneumonia and transferred to the American hospital in Beirut on 13 November. An entry in his service record for 16 November reports he was very ill with tuberculosis and on 13 December he was taken by hospital shipfrom BeiruttoAlexandria, where he is “kept in bed”. On Christmas Day Alfred says he “got up for the event but suffered for it next day or so”. He was in the 87th General Hospital in Alexandria until 26 February 1919 when he was moved to the British Red Cross Hospital at Montazah. On 23 March 1919 Alfred embarked for home on hospital ship Dongala. On 25 March, Alfred records that a “man jumps overboard and was lost”, while the following day they “pass Italy and Sicily and go through the Straits of Messina. Very lovely sights. Mount Etna and Stromboli”. Alfred’s diary ends with an entry on 28 March “Sea very rough. Arrive at Marseilles but could not go in to harbour”. Alfred’s military record marks him as “home” from 2 April 1919 and he initially spent some time in the military hospital at Endell Street in Covent Garden. 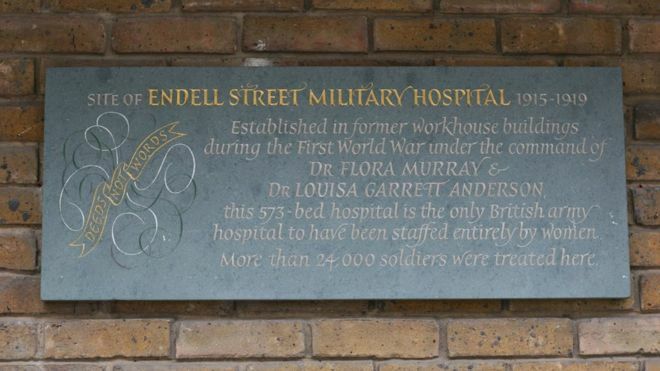 The Endell Street hospital was established in May 1915 by two women doctors and was the only hospital to be staffed entirely by suffragettes. We do not know how long Alfred was in the Endell Street hospital or what duties he returned to after his convalescence. Alfred had much to contend with upon his return home – recovering his health, coming to terms with his experiences of war and the loss of his baby daughter and grandfather, as well as the prospect of readjusting to civilian life and looking for gainful employment. To add to this, not long after Alfred’s return to England, on 24 May, his father died at age 51 of pulmonary tuberculosis. Alfred was finally demobilized on 31 March 1920. Alfred and Rosanna went on to have five more children: Sidney, Joyce, Kenneth, Ronald and Beryl. Life was not always easy, with Alfred enduring periods of unemployment. My mother Beryl, who was born in 1930, remembers that money was tight and that Rosanna sought to boost the family income by making and selling items such as toffee apples and ice lollies. Alfred worked as a labourer for Norwich City Corporation and served as an air raid warden during the Second World War. Alfred and Rosanna celebrated their diamond wedding anniversary in May 1975, but sadly Rosanna died only a few months later. Alfred adjusted to life on his own and looked after himself, with support from his family. He died on 13 April 1983, age 91. This entry was posted in Family Reminiscence, War Diary and tagged Egypt, Endell Street Military Hospital, Gaza, Palestine, Suez, WW1. Bookmark the permalink.